Trentham is a rural township north of the Wombat State Forest, between Daylesford and Woodend. It is near the headwaters of the Coliban River and is 75 km north-west of Melbourne. A Presbyterian church was opened in 1860, and farm selections were opened up in the early 1870s. Timber cutting was a pre-requisite for establishing farmlands. A Presbyterian church was built in 1871, and Anglican, Catholic and Methodist churches between 1882 and 1892. 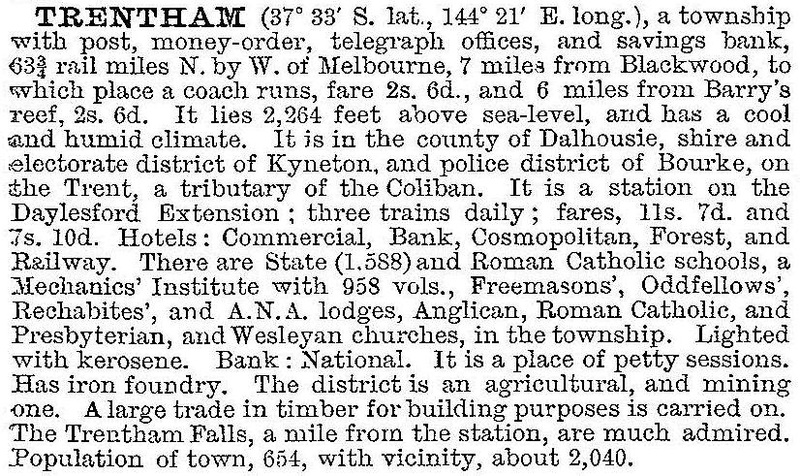 In 1880 a railway line was opened from Carlsruhe (near Kyneton) to Daylesford, via Trentham. By the turn of the century most of the good timber had been removed from around Trentham, but its economy was assisted by the cutting of firewood, its function as a railhead for Blackwood and employment at Trewhella’s factory. Forest regrowth and plantation forests enabled a timber impregnation factory to be opened after World War II. The elevated, cool climate was also suitable for potato growing and plant and tree nurseries. In 1978 the railway line was closed, but the station has been preserved. Monthly markets are held there. Trentham has a primary school (97 pupils, 2014), three churches, a hall (mechanics’ institute), a private bush-nursing hospital, a timber-treatment plant and sawmill, a hotel, a golf course, and bowling and tennis facilities. The timber Cosmo Hotel was badly damaged by fire in 2005. A clock in the main street celebrates Trentham's famous country doctor Gweneth Wisewould (1884-1972). Trentham’s tourist attractions tend to be overlooked because of the town’s location away from main highways. Attractions include the Trentham Falls, the historic Trewhella foundry, a berry farm and plant nurseries. The Trentham water-supply picnic area and Firth Park forest picnic area are in the direction of Trentham East. Still dotted around Trentham’s farms are huts used by itinerant spud diggers.